Our Lady of Good Health, also known as Our Lady of Vailankanni, is a celebrated Catholic title of the Blessed Virgin Mary believed to have appeared in Velankanni Town, Tamil Nadu, India. According to traditional beliefs, the Marian apparition is said to have occurred to a young boy delivering milk to the neighborhood when the Virgin Mary, carrying the child Jesus, is said to have appeared. 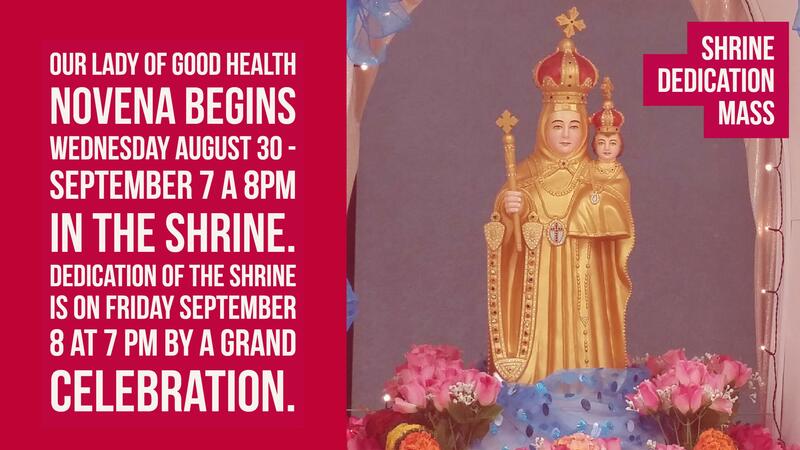 The faith community of St. Paul proudly announces and invites to the Dedication of the first standing Shrine in honor to Our Lady of Good Health of India in Florida to be held Friday, September 8, 2017, at 7pm preceded by a 9-day Novena from August 30-September 7 at 8pm in the evening next to the new Shrine. All are welcome! We invite you to celebrate with us a Novena Prayer and Mass every third Friday of the month at 7 pm at St. Paul Catholic Church.